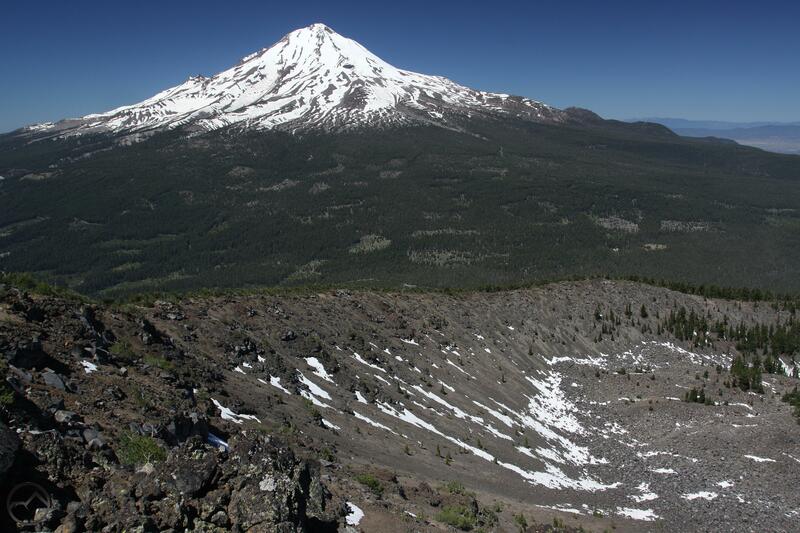 Ash Creek Butte is one of the most scenic and geologically fascinating mountains in the Mount Shasta area. It is tall, has a beautiful, rugged appearance, and boasts fantastic views. Like most of the California Cascades that lie east of Mount Shasta, Ash Creek Butte is draped in a cloak of anonymity that keeps it off the radar of most hikers. Nonetheless, the peak is one of the highlights of the block of mountains on the remote, eastern side of Mount Shasta. This area is definitely one of the more attractive portions of the California Cascades, complete with vast meadows, rushing mountain creeks, hidden lakes and old forests. While sharing many of these qualities, Ash Creek Butte boasts some unusual geology that sets it apart from the other mountains around it. 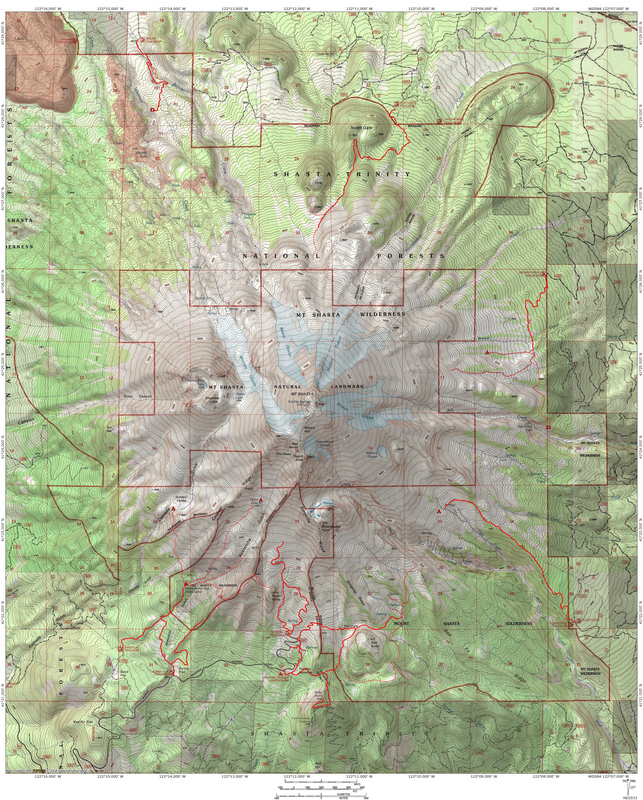 The geologic centerpiece of Ash Creek Butte is the Ash Creek Butte rock glacier. Even though this formation lacks notoriety, it is unusual and scenic enough to have been designated the Ash Creek Butte Fossil Rock Glacier Geologic Area. Though seldom seen, it deserves far more attention than it gets. Rock glaciers are unusual geologic phenomena. In many cases, they consist of actual glacier composed of ice but have been completely or partially overlain by a layer of rock debris. 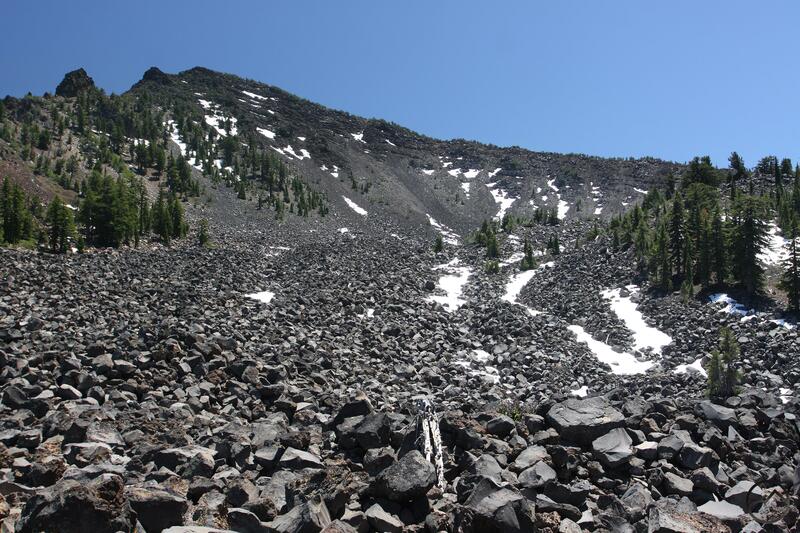 The lowest section of Mount Shasta’s giant Whitney Glacier is one example of this. However, the Whitney Glacier is not a rock glacier, since the preponderance of the ice is uncovered by rock and exposed. Most rock glaciers containing ice are completely covered with rock and the ice is not visible at all. The other kind of rock glaciers is actually the remnants of past glaciers. The ice has long since melted out but the rocky debris carved out of the mountain by the glacier remains. Amazingly, the ancient glacier’s flow pattern is usually visible in the rock pile. Streams of rock, lobes, layers and other evidence of movement are often visible, especially when viewed from above. Fossil rock glaciers also boast other features typical of live glaciers, including moraines and lakes. It is because of the evidence of motion, of the glacier’s “life” that these types of rock glaciers are sometimes referred to as fossil rock glaciers. There are actually two large rock glaciers on Ash Creek Butte. One lies on the east side of the mountain while the main rock glacier is found in a large basin on the north side. The latter is preserved in the Klamath National Forest’s Ash Creek Butte Fossil Rock Glacier Geologic Area. It covers a surprisingly vast area, surrounded by tall, scree-covered craggy cliffs. Scrambling through the expansive talus is reminiscent of the journey through the infamous boulder field at Long’s Peak in Colorado. From afar, Ash Creek Butte seems like a volcanic peak similar to the many volcanos that surround it. 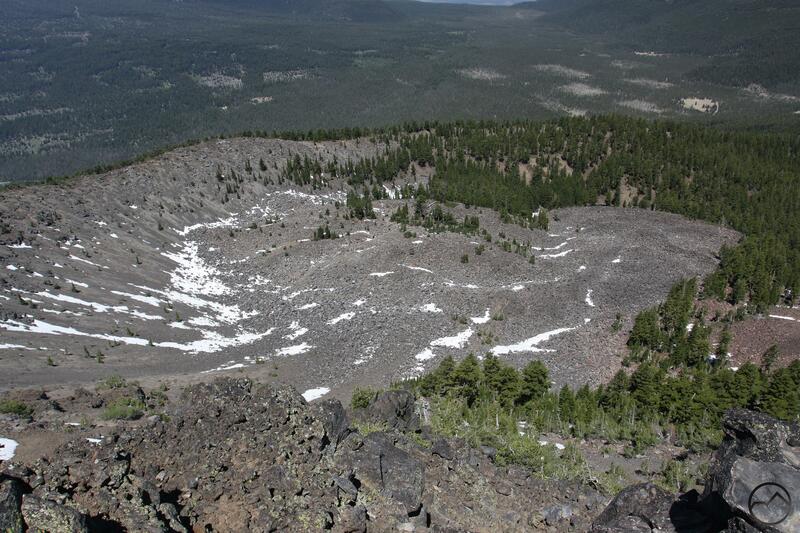 Several nearby peaks like the Whaleback and Goosenest have craters on their summits. It is easy to mistake the rock glacier as evidence of a past, massive eruption since the cirque that contains it has the appearance of a crater. However, this is not the case. The “crater” was actually scoured out of the mountain by the ancient glacier, leaving the giant cup on the side of the mountain. Ash Creek Butte, alone among all the Cascade peaks in the Mount Shasta area save only the great mountain itself, has experienced glaciation. It is uncertain why it is alone in this regard, but perhaps its proximity to Mount Shasta and southerly distance from the mountain’s rainshadow created the conditions for the glaciers to form. Looking at the large hoodoo from the summit. It should be noted that saying the mountain lacks a crater is not saying that Ash Creek Butte is not volcanic. Evidence of past volcanism abounds. The most obvious indicator is the composition of the rock in the fossil rock glacier. 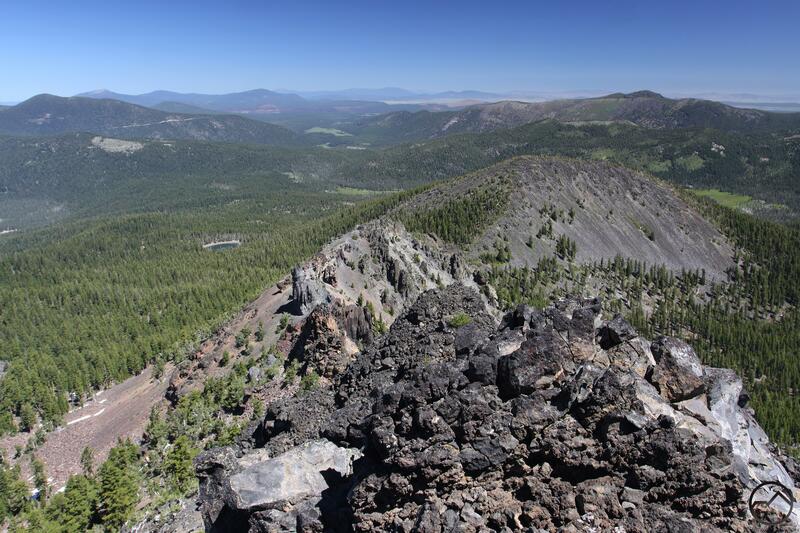 Composed of gray and red andesite and dacite, it has a similar composition to Mount Shasta. Basalt and tephra, other types of volcanic rocks, are also present higher up on Ash Creek Butte. Even more interesting is the presence of a large hoodoo on a ridge below the summit. While there does not seem to be much history of eruptive activity (assuming the glacier did not carve it off the mountain) this hoodoo is evidence of past volcanism. Whether it was just a vent or was the main volcanic neck is uncertain. Nonetheless, it remains a reminder that fire shaped Ash Creek Butte, just as ice has. Another interesting feature of the rock glacier is the presence of lakes. Ash Creek Butte claims two and it is surprising that they are not more popular destinations for hikers. In geologic terms, the most interesting is the tiny lake at the foot of the glacier. 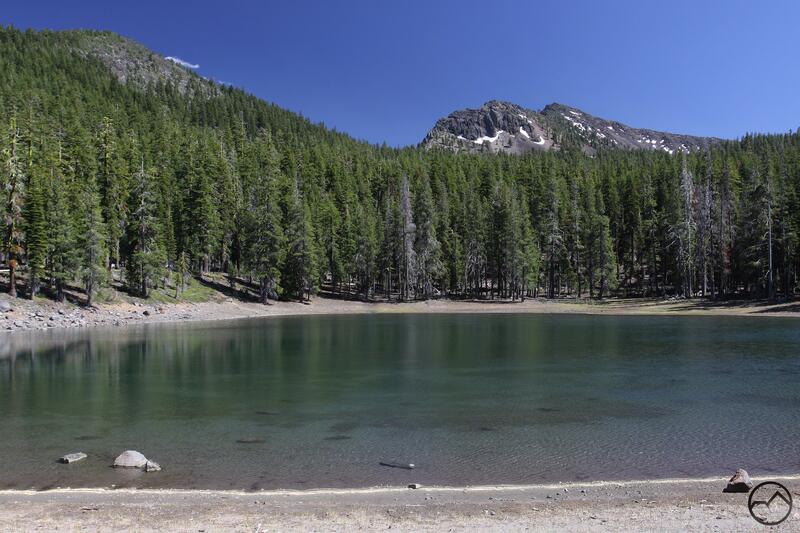 It is common to see lakes form at the point where glaciers terminate and though this lake is tiny, it is more evidence that ice once flowed like a river from the summit of Ash Creek Butte. Lacking a name, I have dubbed this small tarn Fossil Lake. Though it is small, it is unusually deep and makes a good place for a swim. The water is located right at the foot of the glacier and the rocky debris rises 50 or so feet high above the water. It is a lovely spot. The other body of water on Ash Creek Butte is beautiful Surprise Lake. Further down the basin from the glacier, it indicated how far the ice once extended. No trails lead to Surprise Lake but it is easy to get to. With sandy beaches, turquoise water and the rugged summit of Ash Creek Butte looming overhead, it is a wonderful place to relax and enjoy the deep isolation this area offers. The Ash Creek Butte Fossil Rock Glacier Geologic Area is remote and off the radar, but it remains one of the Mount Shasta area’s more scenic and interesting features. It may be seldom seen, but it is worth the effort to explore it. The ridgeline route to the summit of Ash Creek Butte. Looking down on the eastern rock glacier. I the 60s, I spent a lot of time at this place….I used to hike up an old jeep road that was made by the Eddleman family of Weed. It switch-backed up the side of the butte. They would drive forward one way and back up the next section…there may still be remnants of their road on the top….also there used to be their old camp site on the upper end of the lake in the trees…. That is really cool. What side of the mountain was the old jeep road? If it was on the west side, as if coming from Weed, it may have been obliterated by logging activity or incorporated into the logging network. I am surprised that no trails have been built over there. It is so scenic, I think a lot of folks would hike over there. As I recall, I came in from the south? Side. From the military pass road…I remember the last time I went up there. I took a friend after telling him all about my “secret spot”. Anyway, when we got on top they had a big logging road there and were logging it! I was heartbroken and never went back again…..
I’m sorry, misspelled my name and used wrong email….